At Holistic Gynecology we offer conventional medicine in conjunction with holistic alternatives to support health and healing. We focus on the mind, body and soul connection to provide personalized treatment plans to fit your needs. We provide a wide spectrum of women’s health services, from routine wellness exams to specialized fertility treatments. Through our extensive consultations we get to know you, allowing us to build a doctor-patient partnership that focuses on disease prevention and health maintenance so we can provide you with a comprehensive plan of care. Juaquita D. Callaway, MD has been in private practice since 1990. She is a native of Athens, Georgia, and she received her Bachelor degree from Emory University. 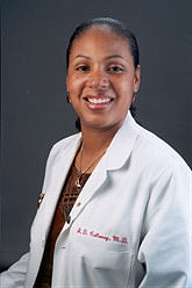 A graduate of the Medical College of Georgia, Dr. Callaway trained in obstetrics and gynecology at Georgia Baptist Medical Center. Early in her practice, she realized that conventional medicine provided only temporary relief for chronic health problems because it often treated the symptoms and not the root cause of illness. Dr. Callaway discovered that natural treatments targeted at the cause of an illness produced better and long-term results. The foundation of her treatment method is a belief that the key to wellness is understanding the origin of disease. Thus each visit is scheduled to allow for discussion and education. This knowledge enables patients to better care for themselves.